I’ve been asked this quite a lot lately, so felt it a good time to blog about it. 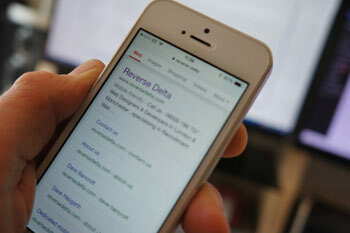 At Reverse Delta, we specialise in recruitment websites, and provide both dedicated mobile recruitment websites as well as responsive recruitment sites. On a smartphone, the top menu becomes a single dropdown and the right hand sidebar appears below the main content. We actually also hide some content from mobile. Our mobile recruitment sites ‘feel’ similar to using a native iPhone app, but without the need to be listed in, and require users to download from an ever-growing App store. They use the latest mobile technology and are optimised, both in screen-size and page ‘weight’ for smartphones. When somebody visits your site using a smartphone, the website ‘knows’ and automatically displays the mobile site. There is also a link to display the ‘desktop’ (i.e. full size) version of the site. 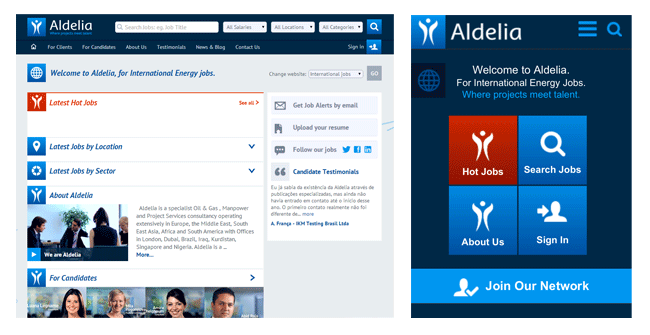 On tablets we display the full site, but there is coding in place to allow candidates to apply without uploading a CV as this is not typically possible on a tablet or smartphone. I’m not sure there is a right answer really – it depends on your situation. Instead, I’ll highlight some pros and cons that will hopefully help you decide. Our mobile ‘web app’ runs in a browser so does not need to be downloaded from the app store, and is cross-platform so it works as well on Android (and Windows and Blackberry) as it does on iPhone. Like all good apps, it is focused on one thing specifically, and it does it well: that is searching and applying to jobs. You can make it easy to navigate by just including the most important content for those ‘on the go’. So, this is very much a candidate-focused experience, although there is also the opportunity to add other pages of content to your mobile site. 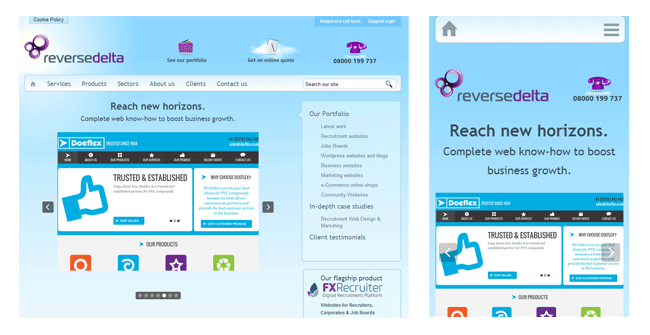 We provide a separate content management system (CMS) for our mobile sites, as we find our clients prefer to put cut-down ‘bite size’ chunks of information on their mobile sites, and not to have as much imagery (e.g. slideshows) as these can slow the site down. We are not yet in a 4G world (in fact many of us still struggle to get a decent 3G connection). Video can also work well on mobile, but does need a decent connection. If you have a website already, adding a dedicated mobile site will usually be the cheaper option, rather than re-building your existing site to be responsive. You have two sites to manage (although this is fairly straightforward given you can copy, paste and edit as necessary). If your developers are making changes, they may need to be made on two code bases. Your users get a different experience on smartphones than they do on tablets and desktops. The focus is on ‘actions’ (searching and applying) and typically has less information for those looking for more details about your services. People visiting pages that only exist on your ‘full’ site from a smartphone will see the desktop sites page, which may not be well optimised for the smaller screen. You have a single website to manage. Changes to your website can be seen on all devices. Your users get a similar experience regardless of the device they are using. You can target both clients and candidates as the content is the same regardless of the device. If you are having a new website designed, then responsive should certainly be a consideration, for future-proofing, but good user interface design is important to ensure ease of navigation. As previously mentioned, bandwidth can be an issue if your site is heavy on use of imagery. Budgetary constraints should also be considered; currently doing responsive websites well is hard work: the tools are less widely available, and effort in design, development and especially in testing increases because the site has to be designed to work on a myriad of different screen sizes and platforms. In short: it is more costly. It is also difficult to ‘retro-fit’ responsive into an existing website, as responsiveness has to be considered at design time. For a candidate focused experience while we still do not have prevalent 4G networks, the mobile web app may be the better route. If you already have a website, adding a dedicated mobile site will be the cheaper and quicker option. If you are having a new website designed, responsive should be considered, depending on your target audience. If Google-based SEO is paramount, then responsive will be the better option, but bear in mind the additional set up costs. If you are unsure which route to take, you can of course have both, with the mobile website allowing the visitor to view the full site by simply clicking a button or link. The bottom line here is that sites HAVE TO HAVE a mobile friendly counterpart because Google is going to start moving non mobile friendly sites way down in the search rankings. Regardless of what platform used, designers have to make mobile browsing user friendly and easy. It all depends to the industry and client that is using it. There are less changes that someone for example will do research on a dentist via their mobile but they will order a pizza on a mobile.